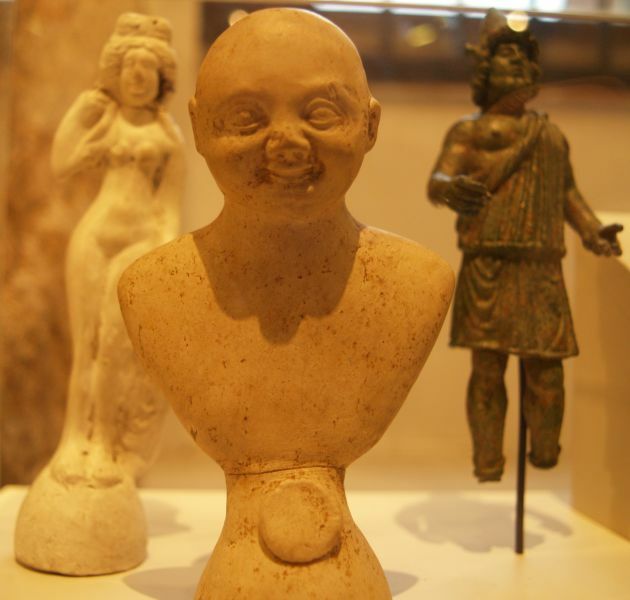 A Classic Roman figure in the Yorkshire Museum - I've tried my best to illustrate the contents of the Yorkshire Museum, York. 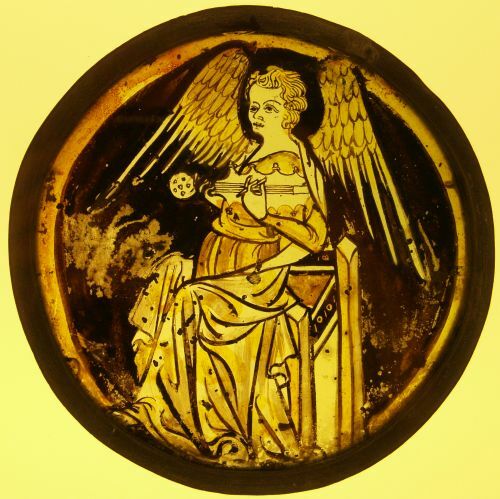 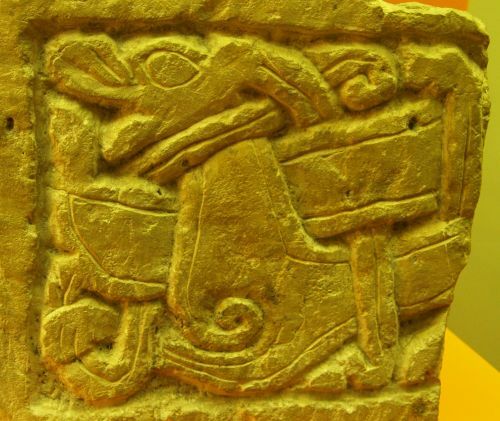 The pictures are in no particular order and mainly range from the Roman period, through Anglo-Saxon & Viking eras to early and late medieval periods. 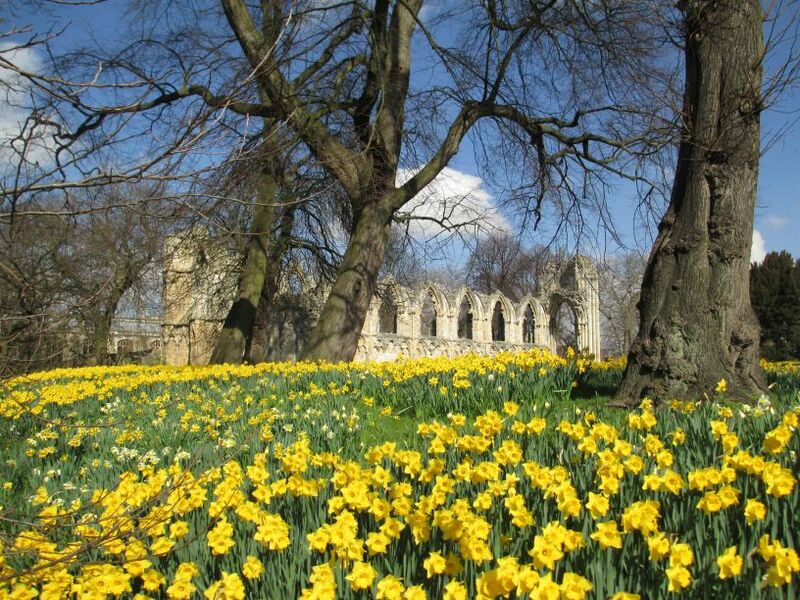 The Yorkshire Museum is set in the attractive Museum Gardens. 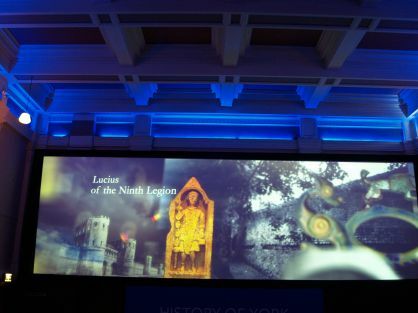 The entrance to the Yorkshire Museum, York. 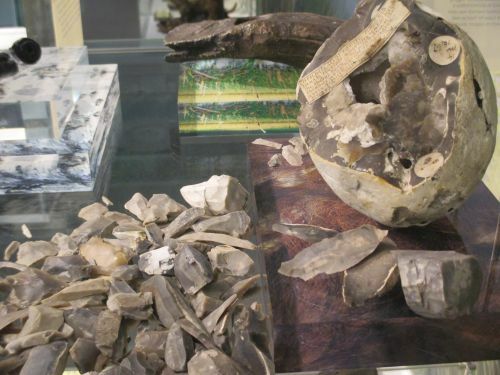 The Yorkshire Museum was founded by the Yorkshire Philosophical Society to house their geological and archaeological collections, and was originally housed in Ousegate, York, until the site became too small. 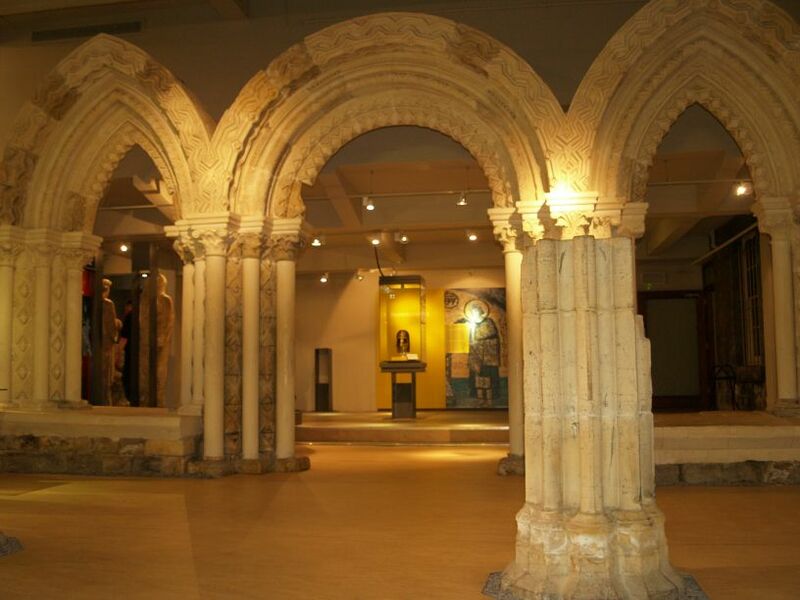 In 1828, the society received land formerly belonging to St Mary’s Abbey for the purposes of building the new Yorkshire Museum. 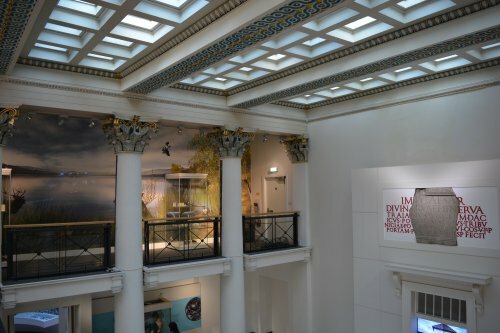 The main building of the museum is itself called the Yorkshire Museum and was designed by William Wilkins in a Greek Revival style and is a Grade I listed building. 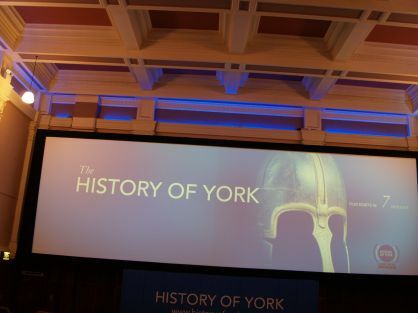 The Yorkshire Museum officially opened in February 1830 making it one of the longest established museums in England. 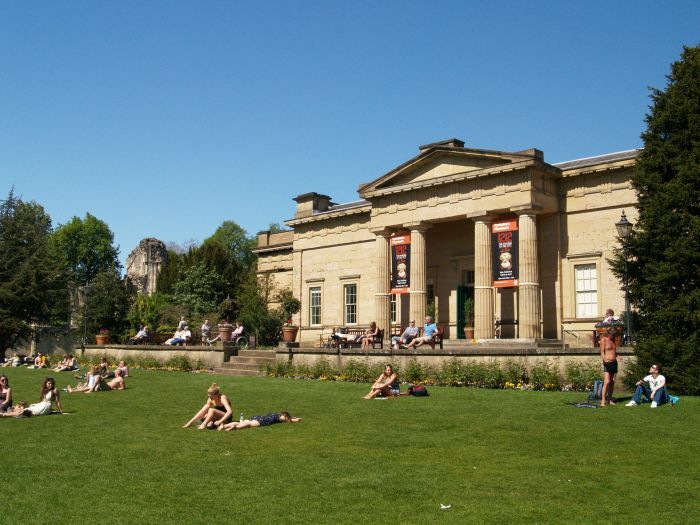 A condition of the royal grant was that the land surrounding the Yorkshire Museum building should be a botanic gardens and so, one was created in the 1830s. 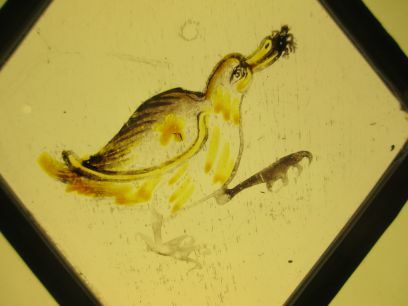 The botanic gardens are now known as the Museum Gardens. 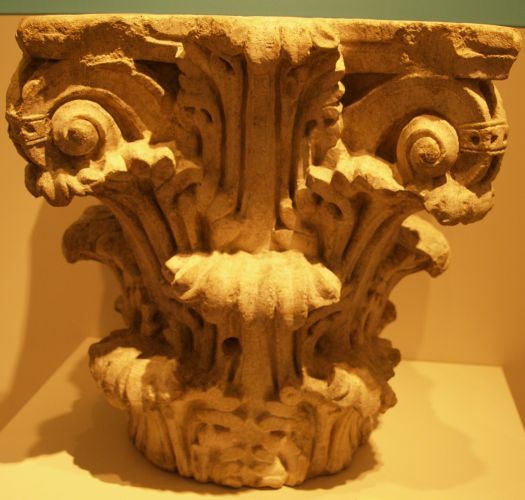 The interior of the Yorkshire Museum has some fine architectural features. 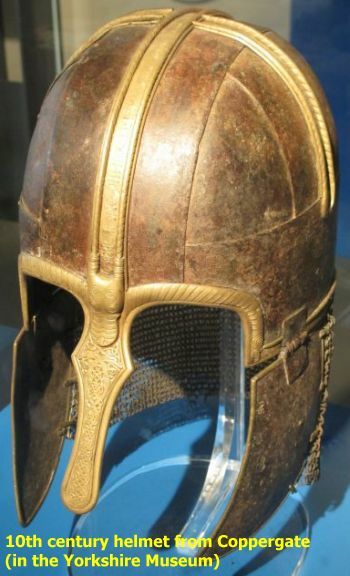 This late 10th century helmet, in the Yorkshire Museum, York, found in a wood lined pit in Coppergate, York, is the most splendid surviving example of its type in Europe. 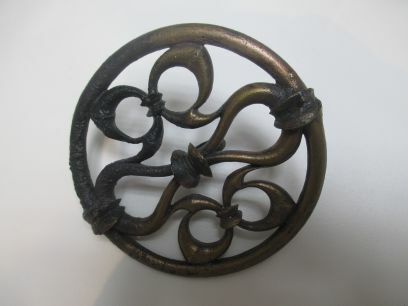 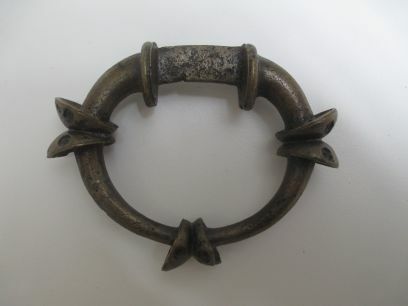 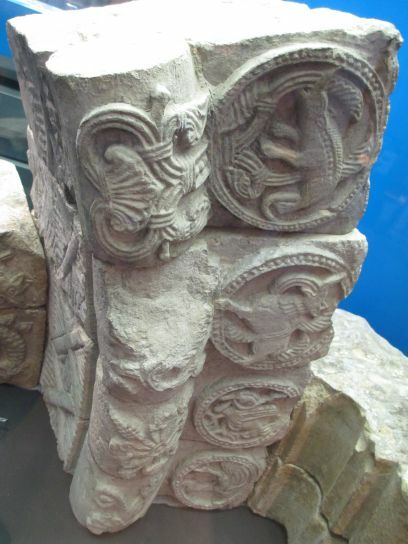 It was probably made for a member of Eoforwic's Anglian Royal family AD 875 - AD 900). 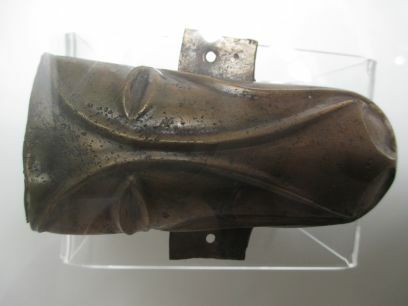 His name, OSHERE, is inscribed above the intricately-cast nose guard. 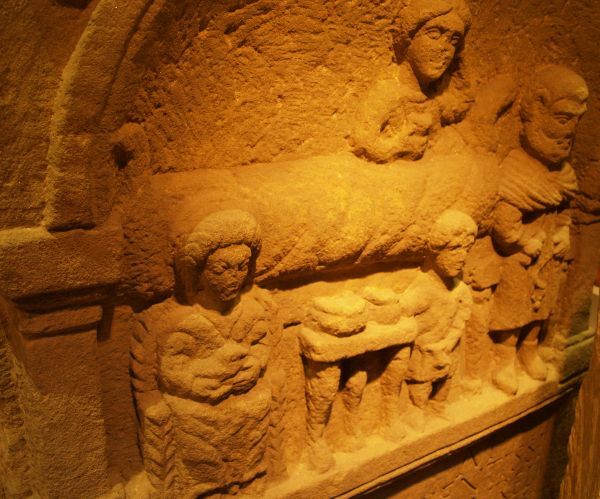 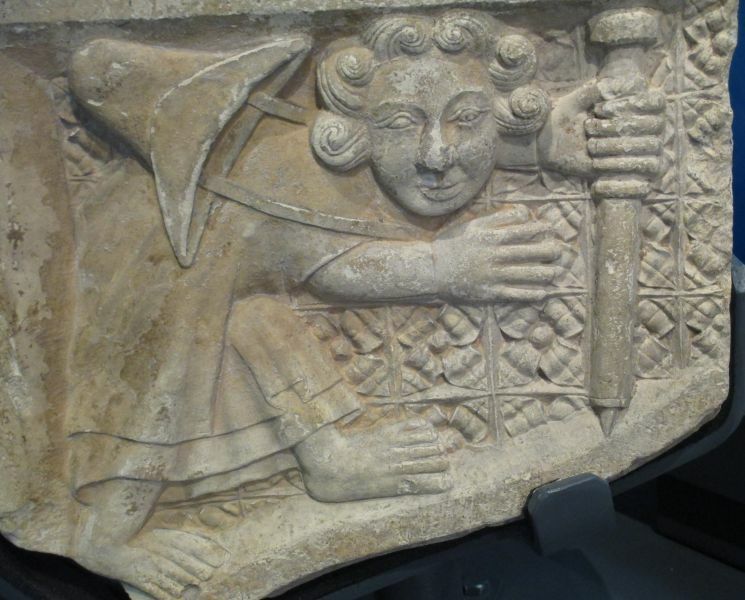 Above and below, in the Yorkshire Museum, York: Roman carving found in York. 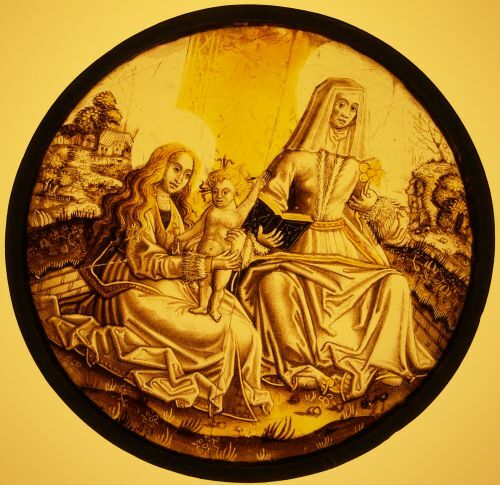 Julia Velva lived a relatively long life of 50 years. 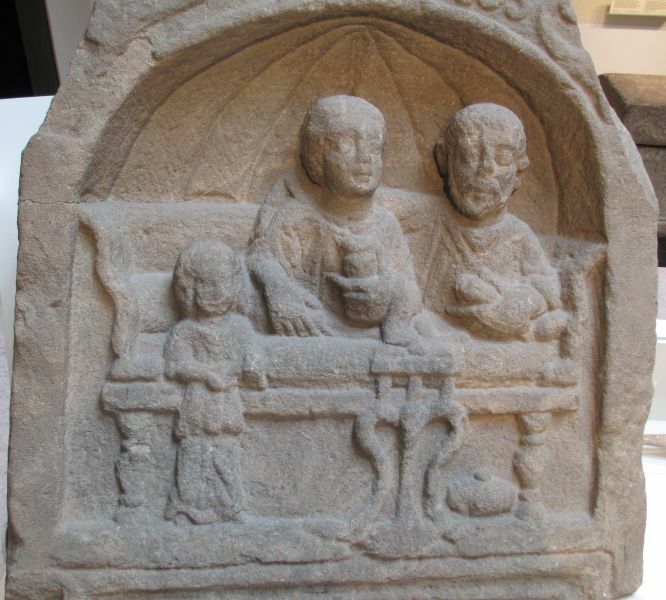 Aurelius Mercurialis, her heir, and his family would gather at this tombstone to celebrate her life on the anniversary of her death. 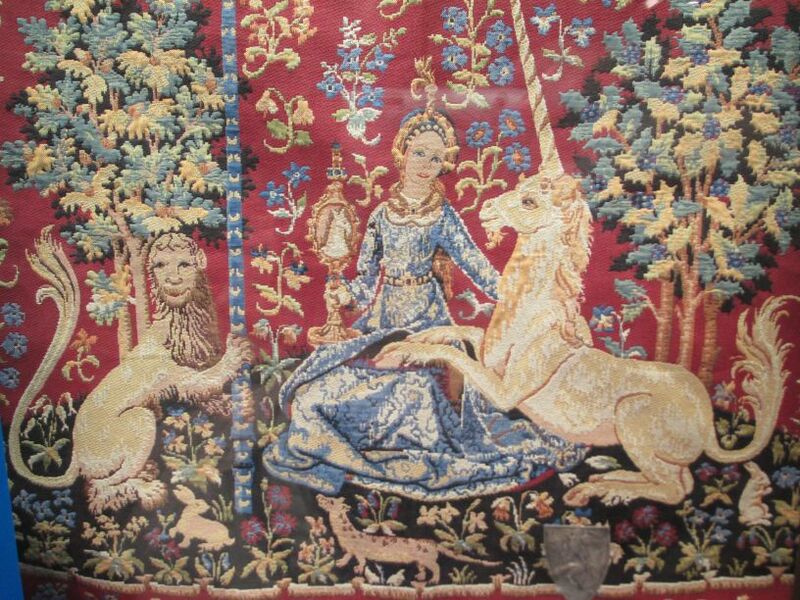 They believed she could take part in the occasion. 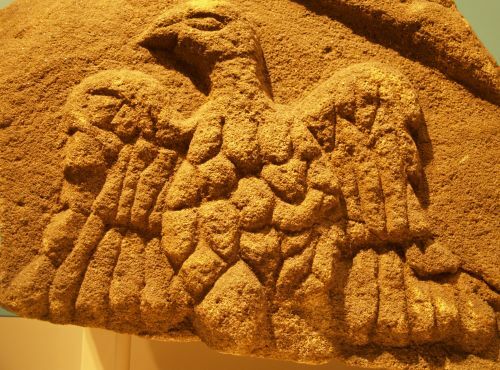 A stone carving of the Roman eagle of the Ninth Legion, in the Yorkshire Museum, York. 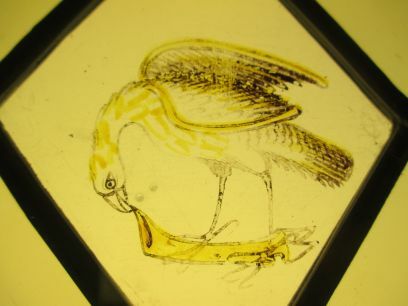 The eagle (aquila) was the messenger of the Greek god Zeus. 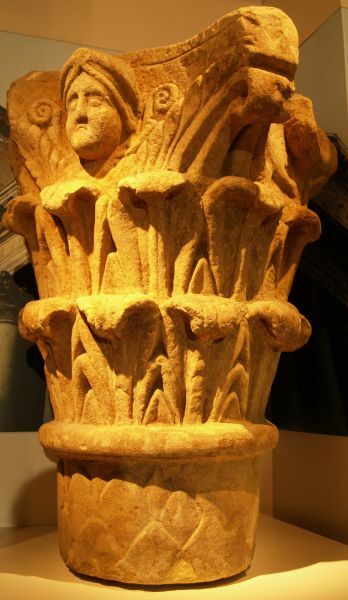 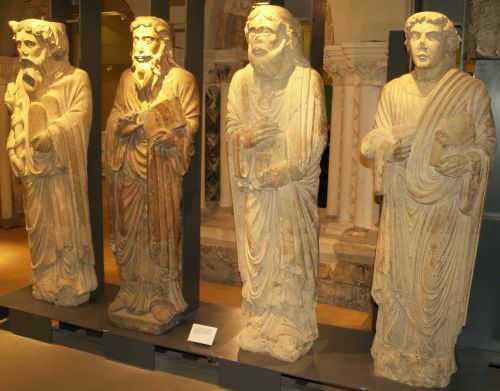 Examples, in the Yorkshire Museum, York, of the Corinthian style of Roman architecture where the tops of Roman columns typically carved with acanthus leaves, scrolls and mysterious faces. 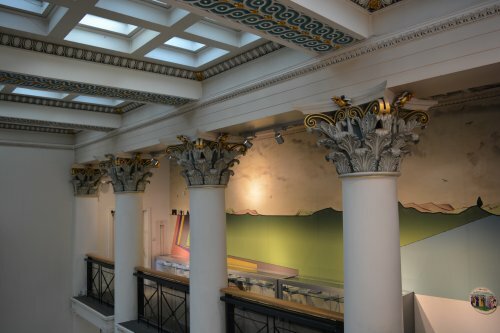 The buildings would have been painted to enhance the majesty and power of the Roman Empire that the architecture was meant to promote. 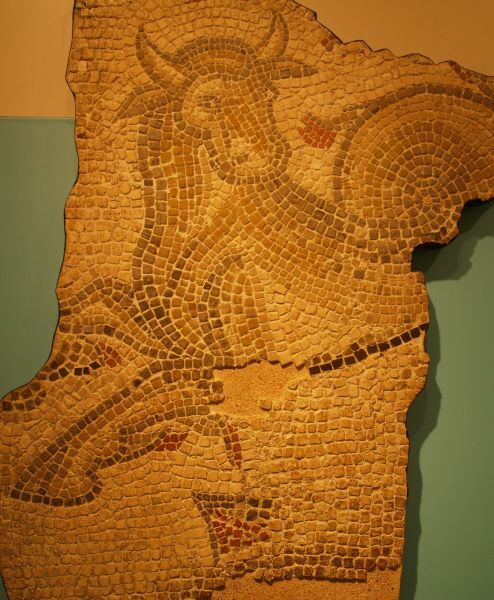 A reproduction?, in the Yorkshire Museum, York, of a more exotic Roman mosaic of protective female spirits, an example domestic art that mirrored what you may find in a Roman temple. 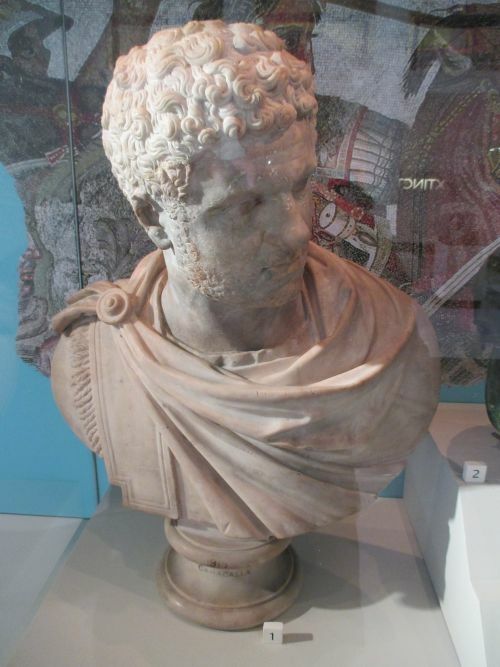 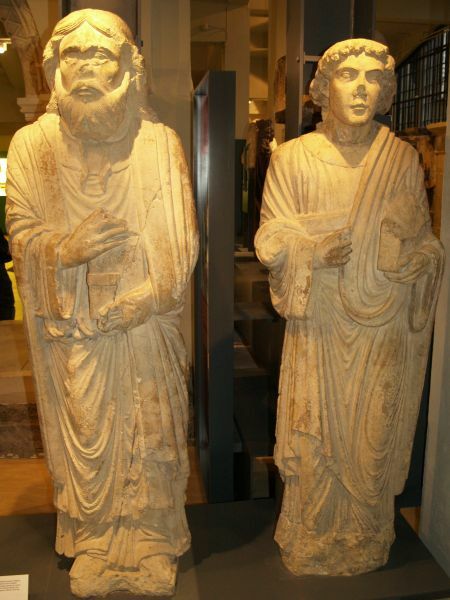 Left: in the Yorkshire Museum, York is a bust of Caracalla who came to Eboracum ('Roman York') with his father Septimus Severus to learn how to command a military campaign. 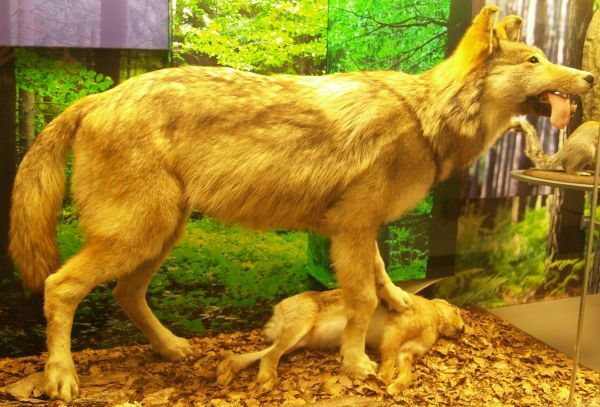 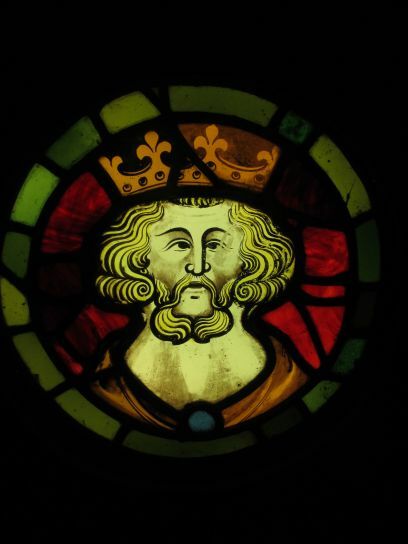 After his father's death he ruthlessly seized control and carried on in the same way. 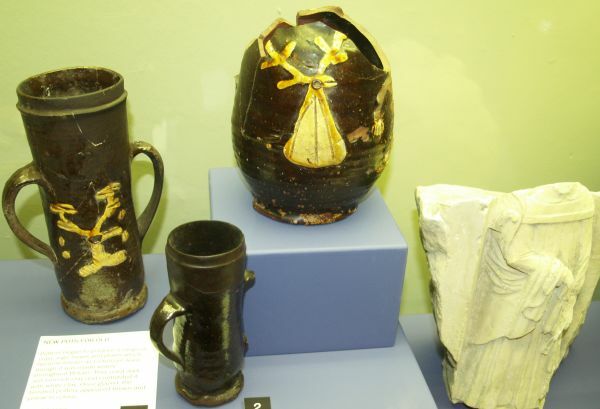 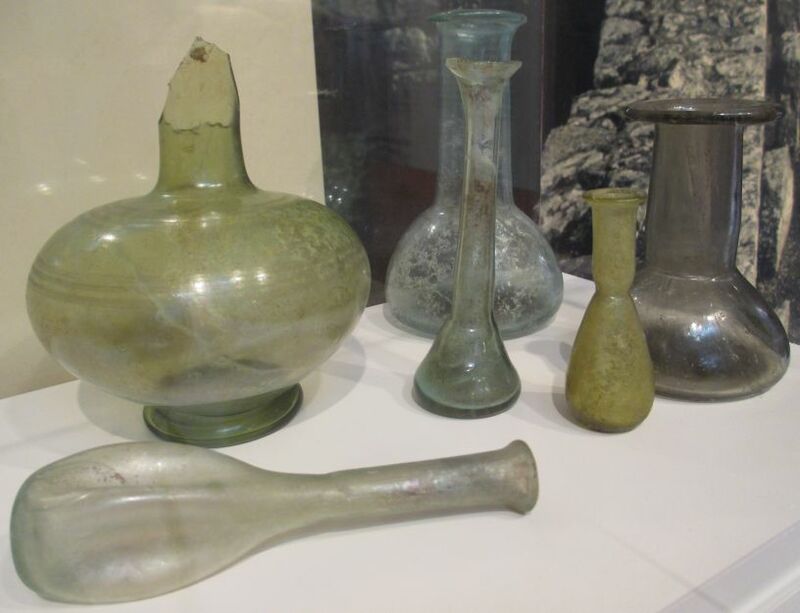 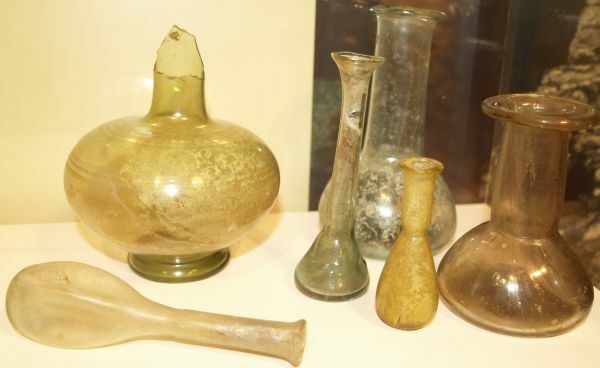 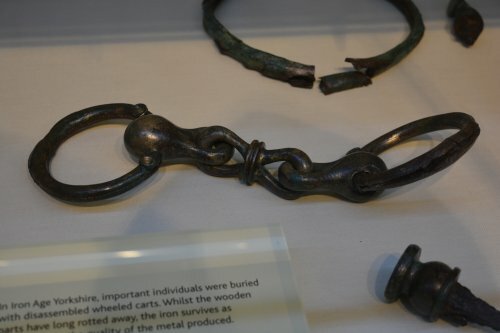 Right: Examples in the Yorkshire Museum, York of more domestic artifacts e.g. 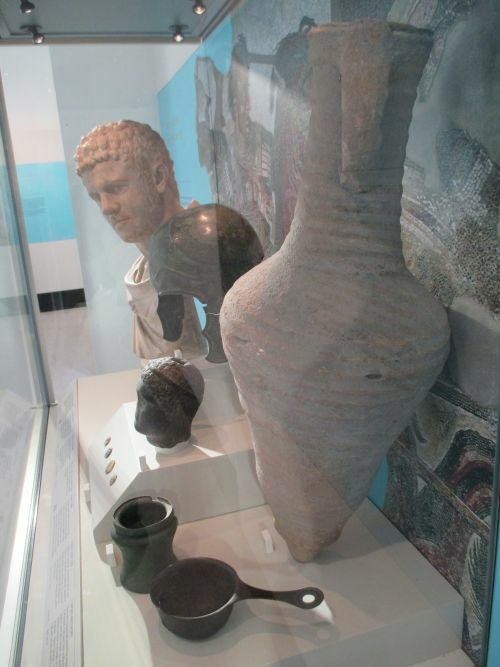 soldier's cooking pots and a large vessels called amphorae in which olive oil or wine could be stored. 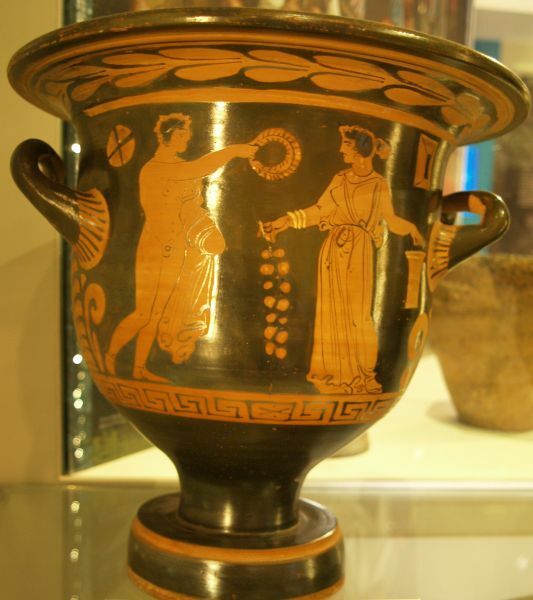 Examples of ancient Greek pottery in the Yorkshire Museum, York. 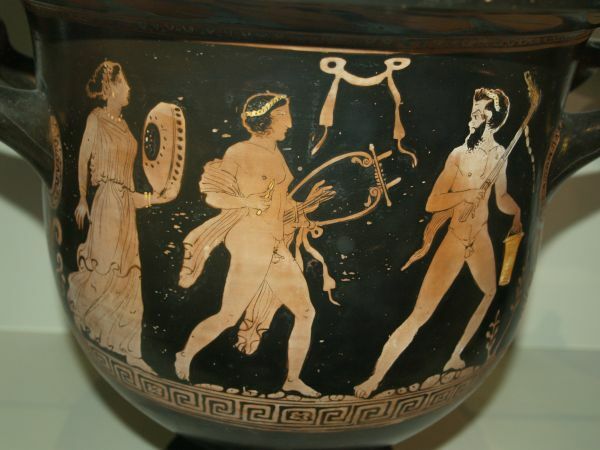 The above depicts the athleticism expected of Greek young men. 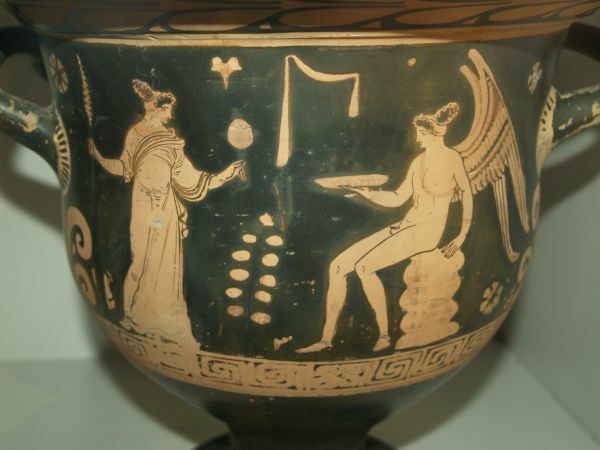 Athletic scenes, domestic scenes, gods etc. 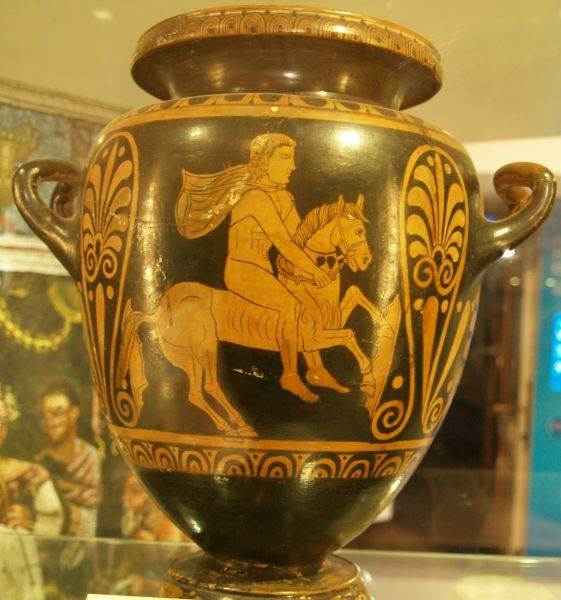 where all beautifully painted onto large pottery urns. 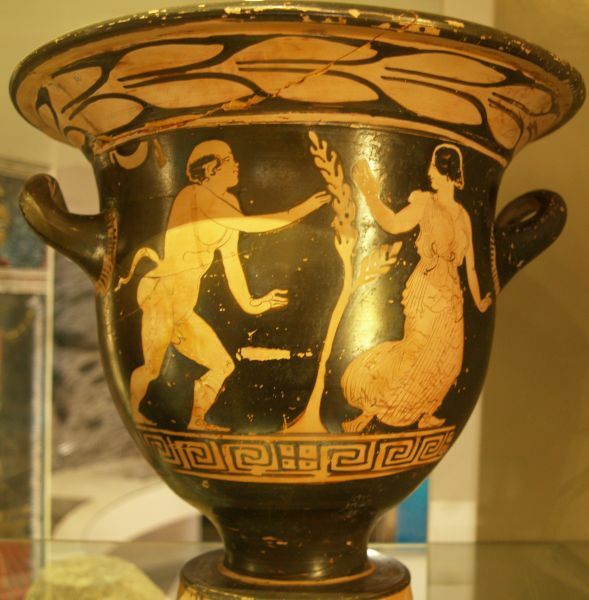 Looking for love, Eros was the god of love, beauty and fertility to which Greek women made offerings (Yorkshire Museum, York). 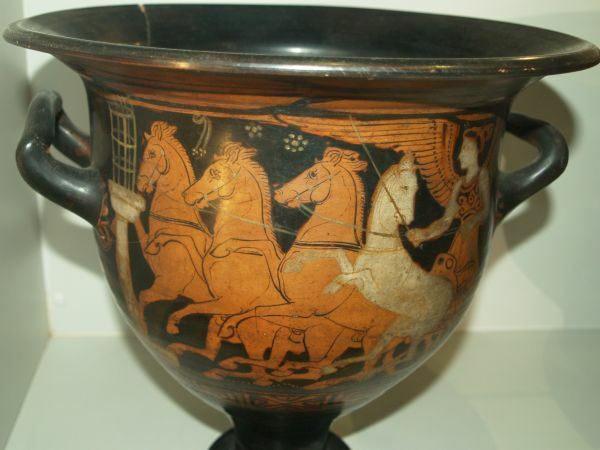 The Greek god Nike, the goddess of victory in war, here riding a four horse chariot (vessel, Yorkshire Museum, York). 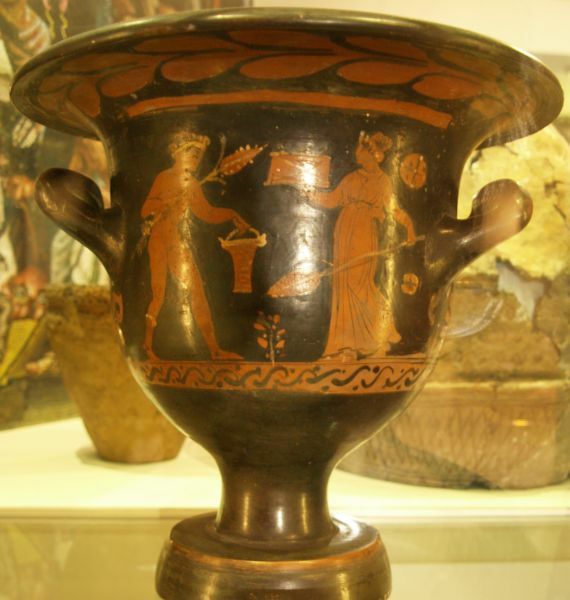 Mars, was the father of Romulus, legendary founder of Rome. 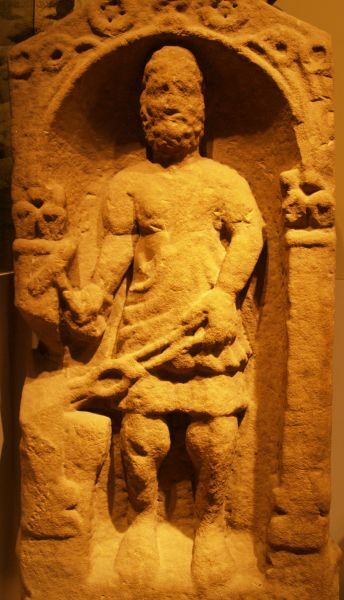 All Romans believed they were descended from him, and Mars was god of war and bloodshed. 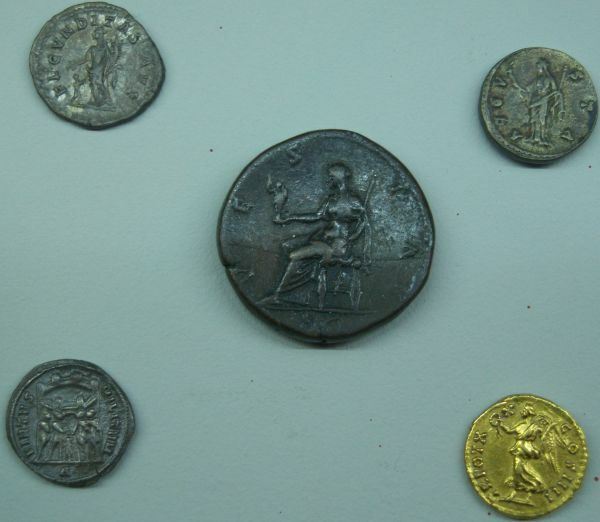 Roman imperial propaganda on Roman coins, depicting them with great virtues! 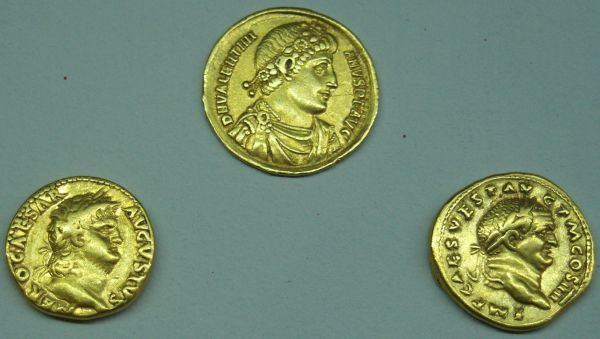 Roman coins, in the Yorkshire Museum, York, depicting Imperial Perfection'! 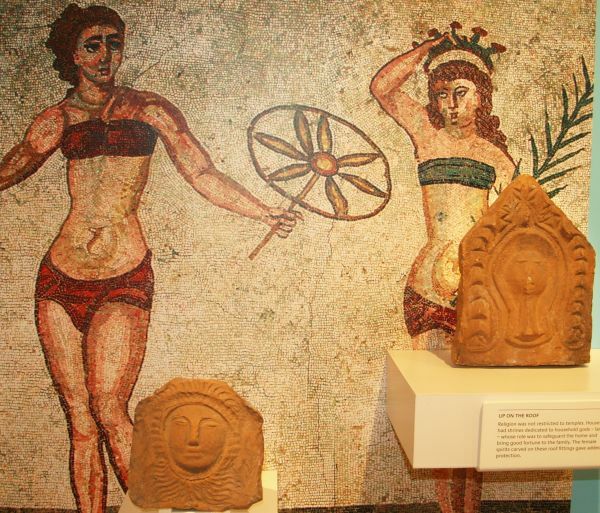 Behind every Roman Emperor there is a beautiful powerful woman, some even became goddesses after their death. 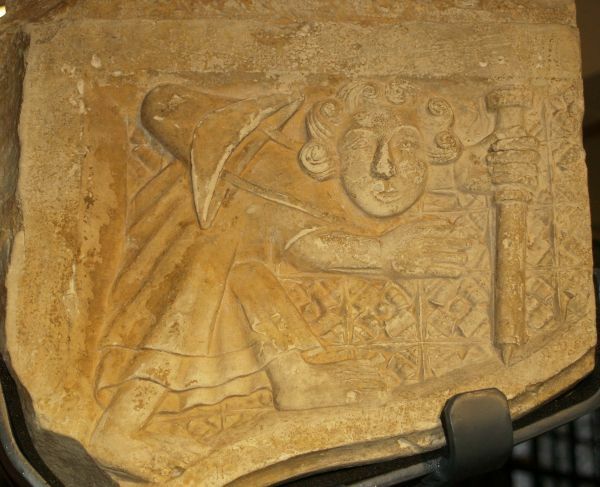 Left: The Roman tombstone of a blacksmith, memorial stones could tell you a lot about a man's (or woman's) life. 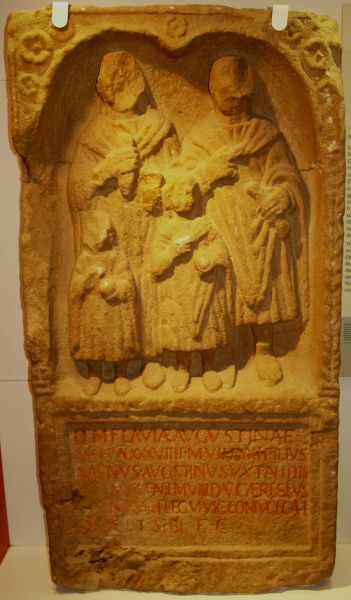 Right: Memorial tombstone to the wife (Flavia Augusta) and two infant children of, an ex soldier (Caeresius Augustinus) who suffered a triple tragedy. 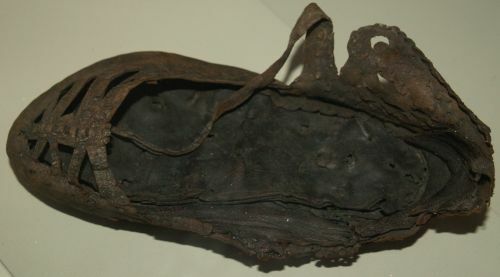 A Roman leather sandal, common footwear for most Romans. 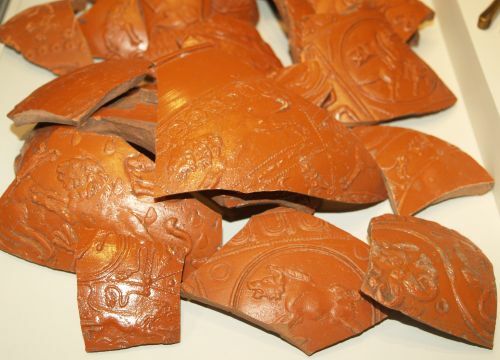 Samian ware, in the Yorkshire Museum, York, Roman pottery from southern and eastern France (Gaul), it was produced in huge quantities. 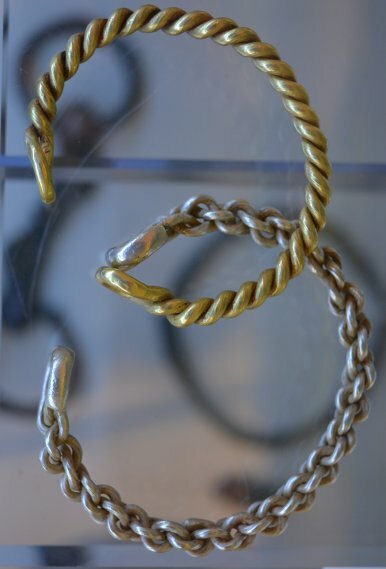 Expensive jewellery, found in a sewer, gold objects from the ? 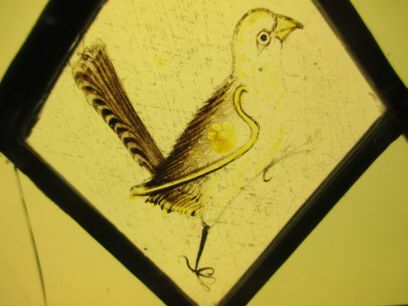 period, in the Yorkshire Museum, York. 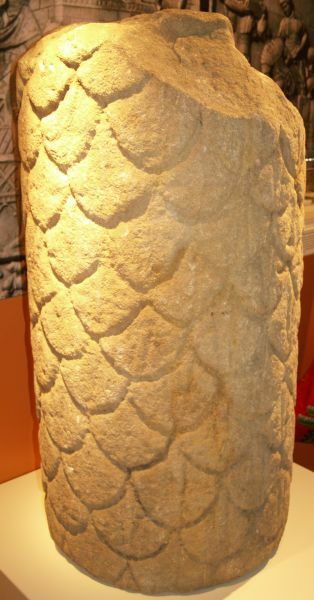 Left: A Roman carving of a legionary column that once partly supported a large stone building. 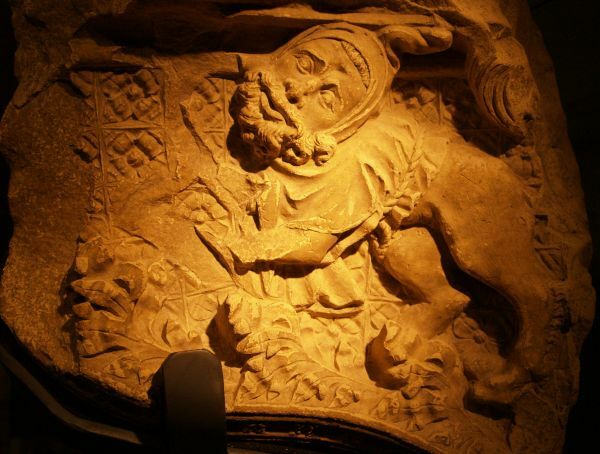 Right: A carving of 'Gone with the Wind' that once topped the corner of a mausoleum. 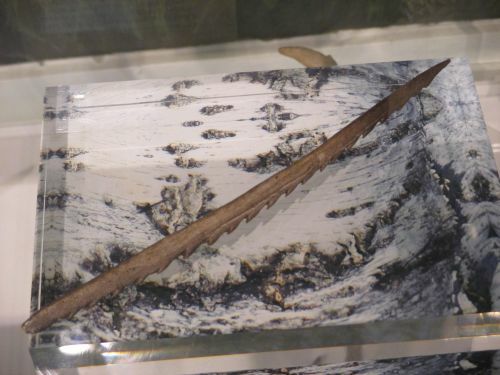 Depictions of the gods Venus, Genius and Vulcan, in the Yorkshire Museum, York..
Fossil of ichthyosaurs, over 65 million years old, in the Yorkshire Museum, York. 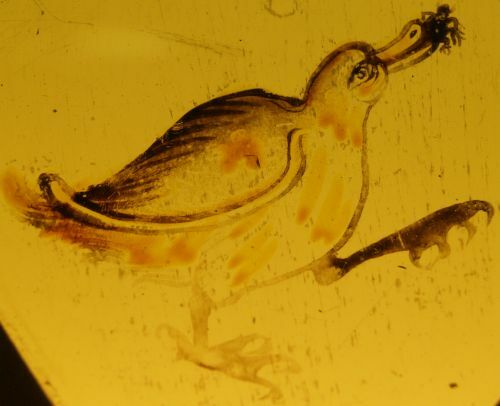 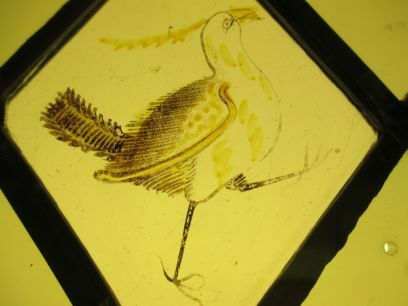 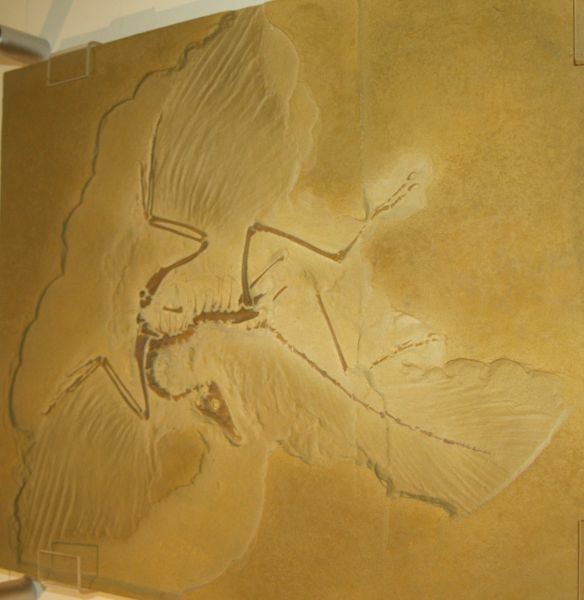 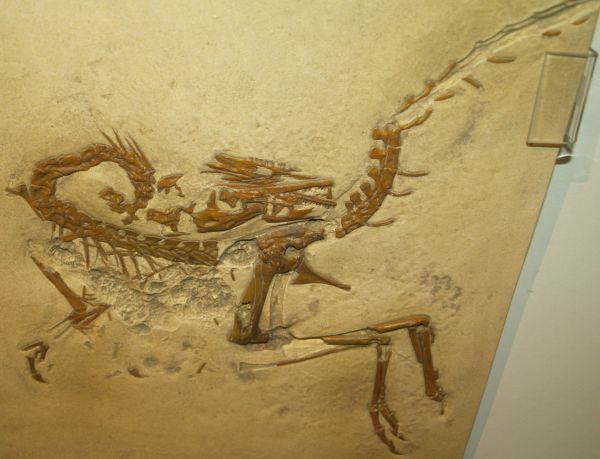 Above & below, in the Yorkshire Museum, York: Fossils of archaeopteryx, the earliest known bird. 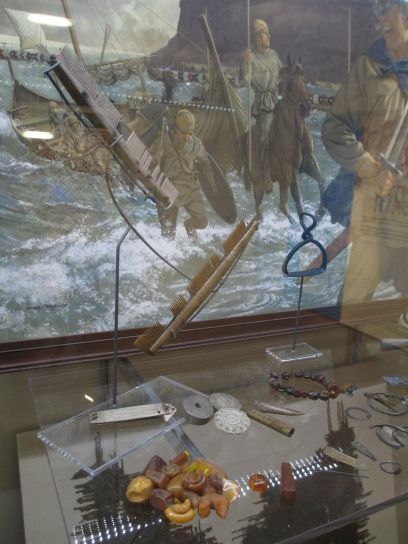 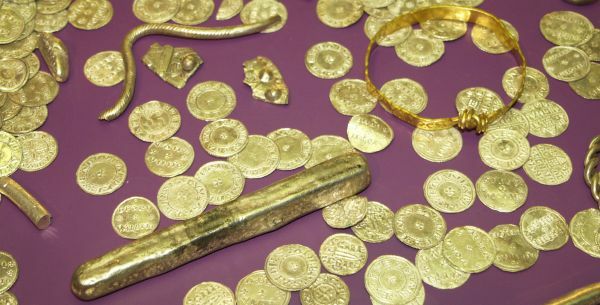 A Viking hoard of coins, ingots and jewellery, in the Yorkshire Museum, York. 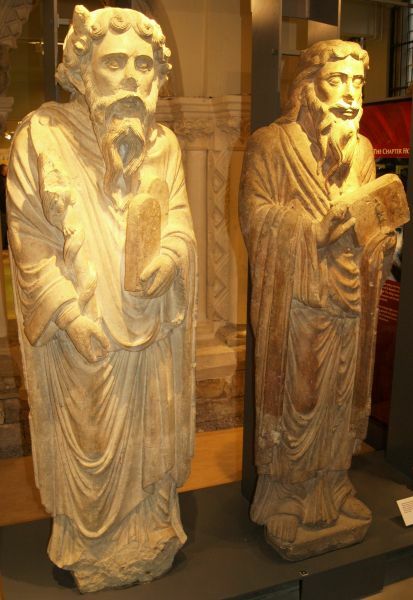 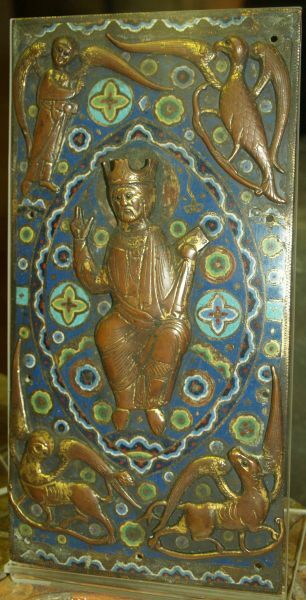 Left: An elaborate book cover (13th century, 1200-1299), well made to protect books, highly valuable objects. 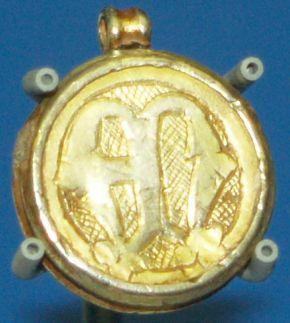 Left: A religious relic engraved with the monogram AM, meaning 'under the protection of Mary'. 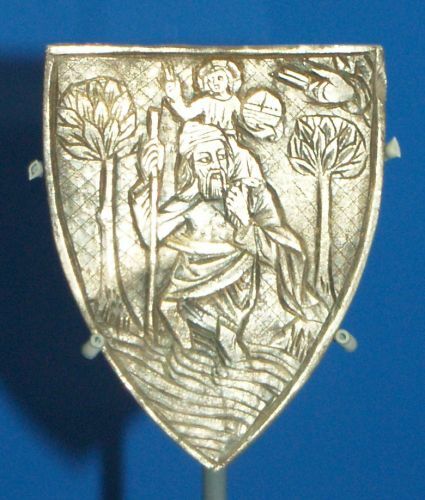 Right: A relic for pilgrim protection, here a depiction of St Christopher to protect the traveller on a pilgrimage, often a dangerous enterprise. 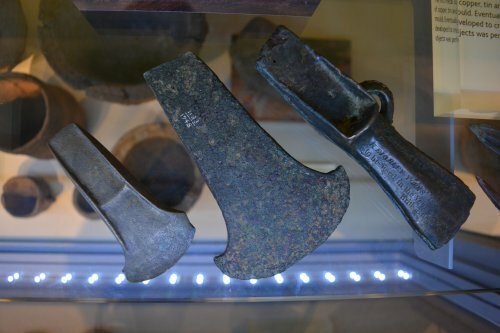 Uses of cow hide, leather goods from knife sheaths to footwear, in the Yorkshire Museum, York. 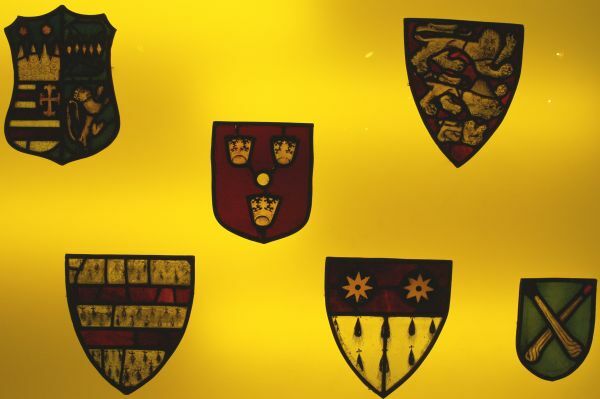 Some medieval stained glass roundels in the Yorkshire Museum, York. 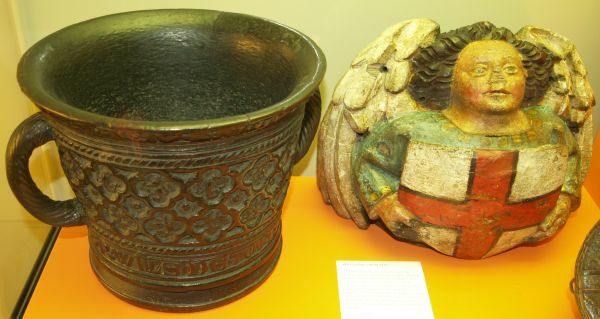 Left: Medieval bell founders made this mortar in 1308 for Brother William of Towton, the infirmarer of St Mary's Abbey, York (Yorkshire Museum, York). 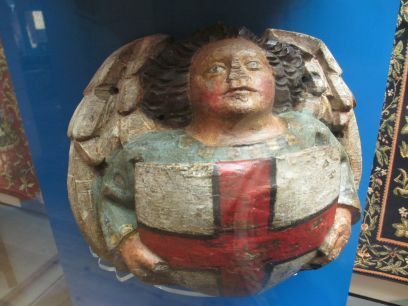 Right: The wooden boss depicts an angel holding a shield with the coat of arms of England (15th century, AD 1400 - AD 1500, from St Martin le Grand church, Coney Street, York). 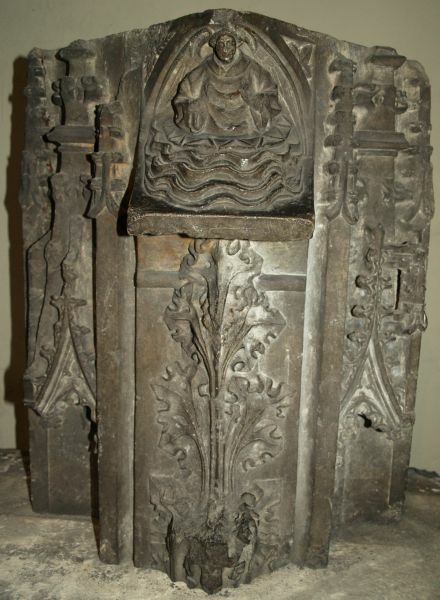 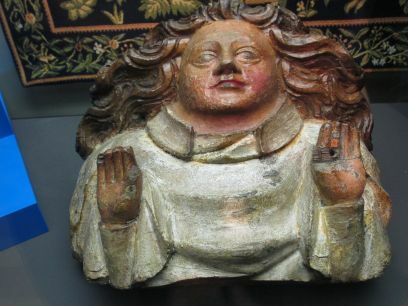 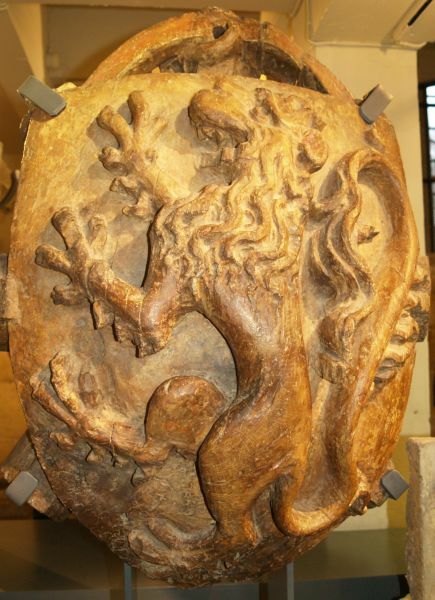 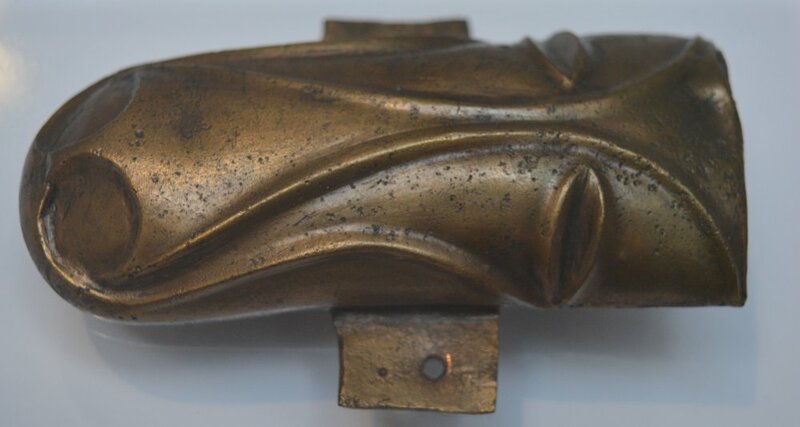 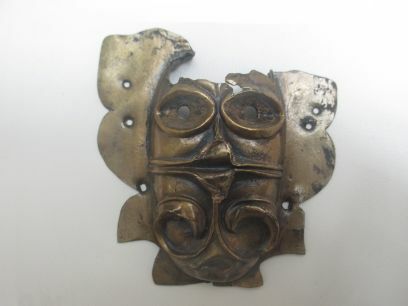 Roof bosses are found on many medieval church roof or ceiling beams (examples in the Yorkshire Museum, York). 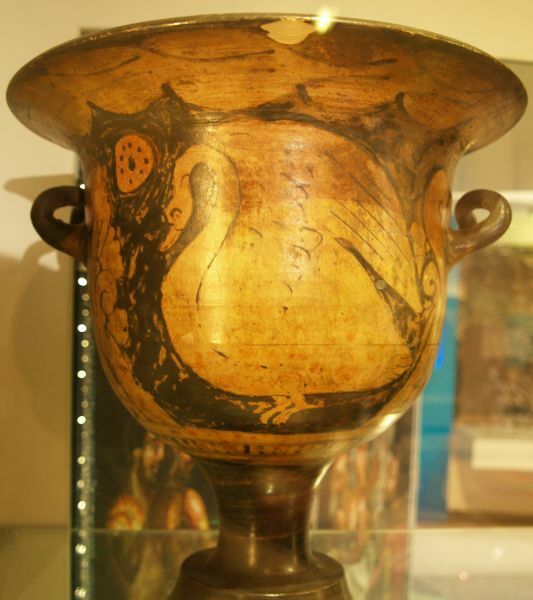 Medieval potters produced a series of pots, cups and jugs known as Cistercian ware (AD 1450-1550) using dark red iron rich clay (Yorkshire Museum, York). 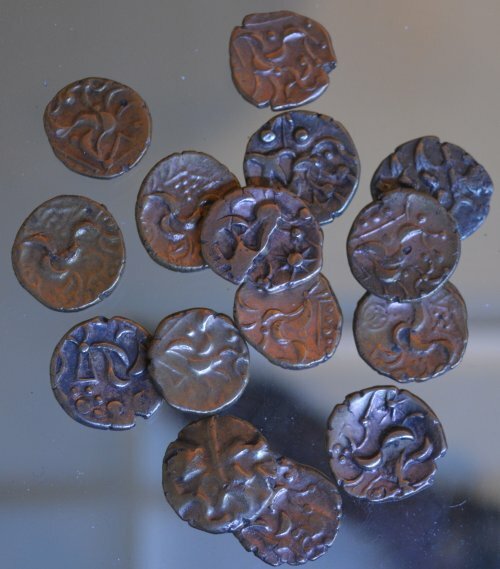 Soldiers were paid in silver coins and securely kept in arm purses (part of Yorkshire Museum, York's coin collection. 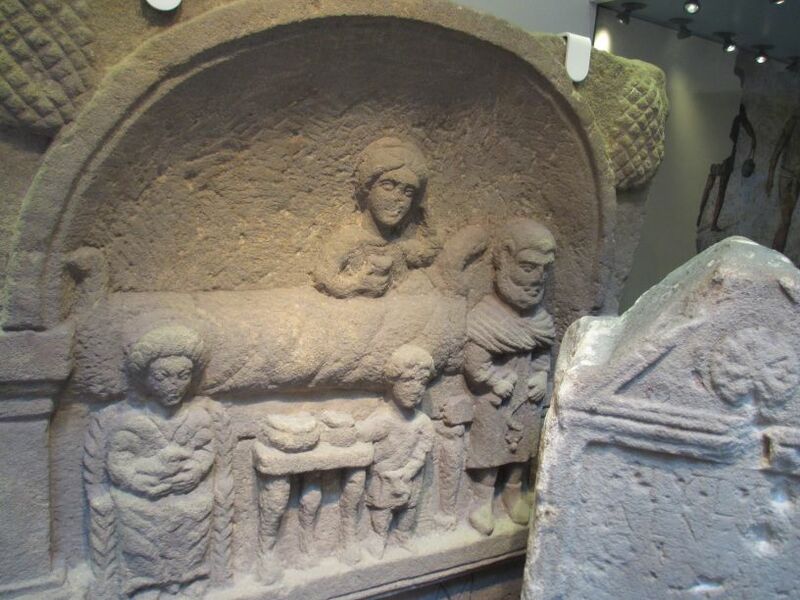 A Roman monument, in the Yorkshire Museum, York, to Aelia Aeliana, depicted reclining on a couch with her husband's arm around her, men often referred to their wives winning qualities in dedications on tombstones. 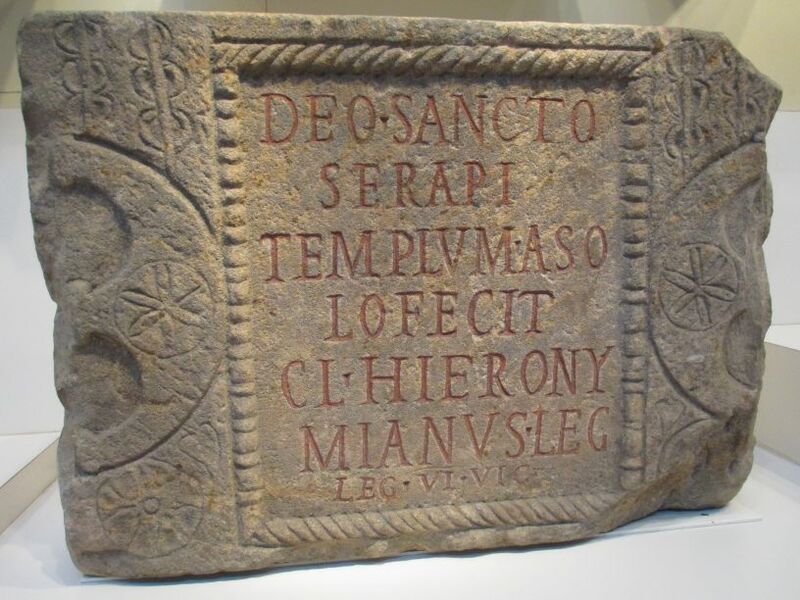 A dedication from a temple to Serapis, a god originally from Egypt, the construction of the temple was paid for by Claudius Hieronymianus, the legate or highest paid ranking officer of the Sixth Legion (Yorkshire Museum, York). 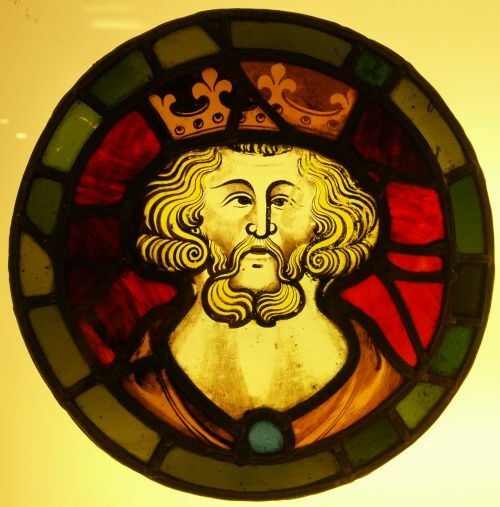 Left: A medieval stained glass panel depicting a king, in the Yorkshire Museum, York. 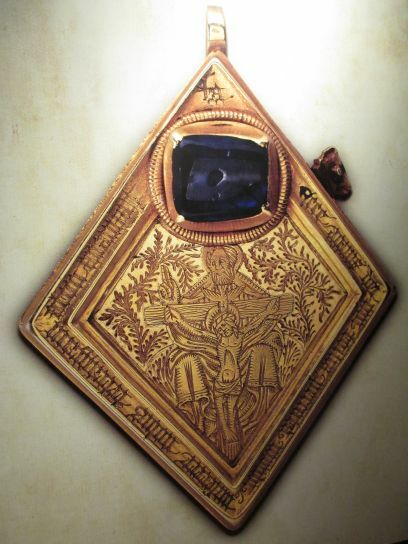 Right: The Middleham Jewel - this amazing pendant in the Yorkshire Museum, York, one of the finest piece of medieval gold-working ever found in England (near Middleham Castle, North Yorkshire). 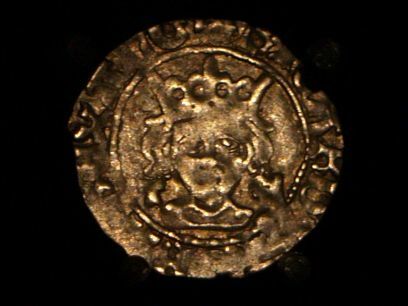 An image of Richard III on coin, the only 'view' most people would have of their king (Yorkshire Museum, York). 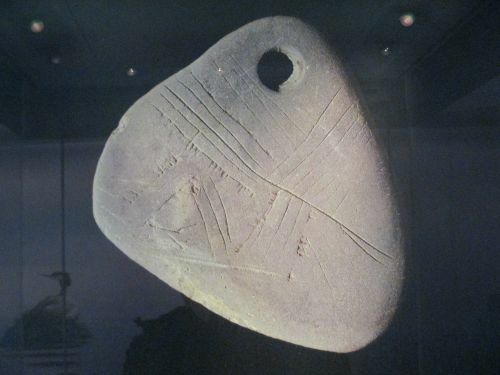 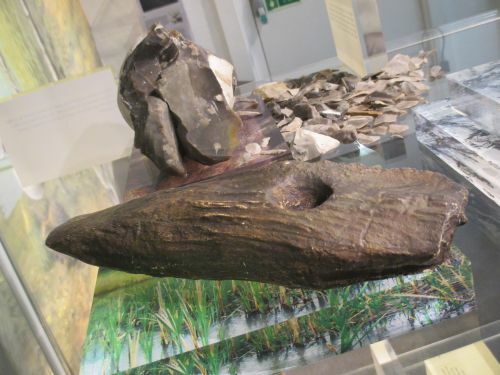 Examples of Mesolithic ('middle stone age) artefacts in the Yorkshire Museum, York, some from the famous Mesolithic site of Starr Carr near Scarborough. 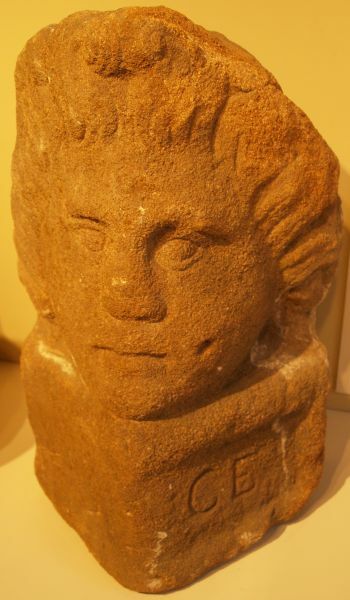 Enter place, feature, church, museum, building, street, anything of historic interest!